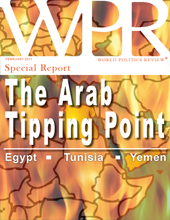 With unrest shaking the Arab world, this World Politics Review special report examines the politics and policies of Tunisia, Egypt and Yemen through articles published from April 2010 to January 2011. Below are links to each article in this special report, which subscribers can read in full. Subscribers can also download a .pdf version of this report from our document center. Not a subscriber? Subscribe now, or try our subscription service for free.